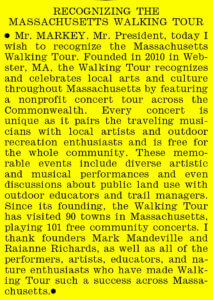 We extend our sincerest gratitude to Massachusetts Senator Ed Markey for choosing to officially recognize the Massachusetts Walking Tour before congress for our annual commitment to promoting trails, arts and culture throughout the state. We are now a permanent part of the congressional record. View the fullCongressional Record from September 28, 2017.